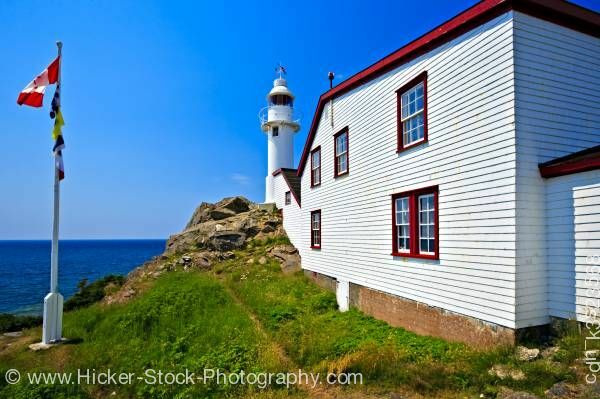 Stock photo of the Lobster Cove Lighthouse in Lobster Cove, Gros Morne National Park, UNESCO World Heritage Site, Viking Trail, Trails to the Vikings, Highway 430, Northern Peninsula, Great Northern Peninsula, Newfoundland Labrador, Newfoundland, Canada. The Lobster Cove lighthouse stands tall overlooking the dark blue waters of Lobster Cove. This stock photo shows the Lobster Cove Lighthouse in the background in Lobster Cove, Gros Morne National Park, UNESCO World Heritage Site, Viking Trail, Trails to the Vikings, Highway 430, Northern Peninsula, Great Northern Peninsula, Newfoundland Labrador, Newfoundland, Canada. This view shows the side of a white building with red trim on the roof and around the windows leads to the lighthouse. The white lighthouse stands tall overlooking the dark blue waters of Lobster Cove. To the left of the building, is a small path on a grassy hillside leads to a rocky ledge looks out on the cove. A tall white flag pole shows the red and white Canadian flag flying in the breeze.